What is it about ruins that make them at once haunting and completely romantic? 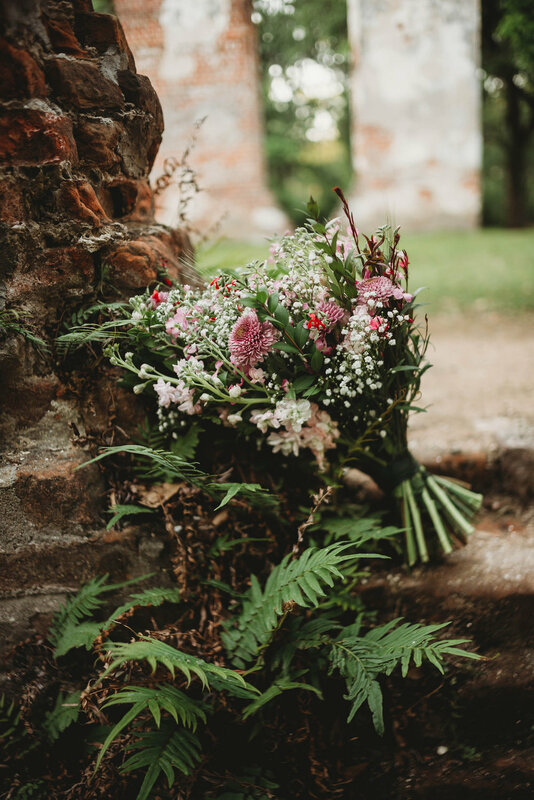 When photographer Morgan Flemming from Bay + Blossom Photography was scouting for the perfect location for her upcoming styled shoot, she knew she wanted somewhere with mystery that was still accessible to the modern couple. The result, her Old Sheldon Church wedding styled shoot in Yemassee, evokes the historic power of this stunning ruin while demonstrating while this property (owned by St. Helena's Church in Beaufort) is still sought after by brides and grooms as an ideal ceremony location. We're in love with the casual groom's look paired with the ethereal lace bridal dress, all backed with the imposing brick ruins of the church. It's haunting Lowcountry wedding perfection!